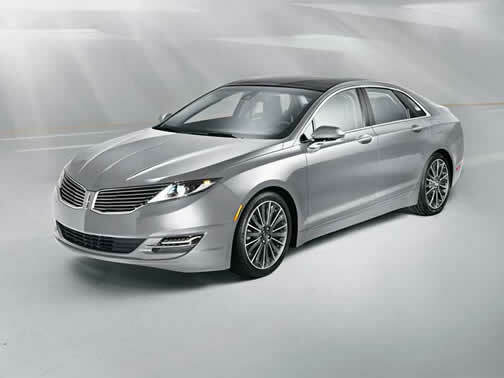 You could call the Lincoln MKZ hybrid a kind of multifunction device. It's not only a pretty nice car in its own right, but its maker appears to have designed it to appeal not only to what could be - perhaps unkindly - considered its traditional audience, but those whose bent tends more toward curve carving as well. Click here or on the image to open a slideshow. It's an interesting tightrope walk. Within a few minutes of having first picked up Lincoln Canada's MKZ hybrid, I hated driving it. It was so darn soft - I read somewhere once that it's as if the car "nods agreeably" when it goes over road irregularities - and it also felt as if it would flip over onto its roof the first time I took it to an off-ramp. It had been a while since I drove a car that rubbed me the wrong way so quickly. Ah, but once I got the car home and started messing with its settings, I discovered a Sports mode that made it not merely acceptable as a driver's vehicle, but quite nice. Well, aside from the awful wailing of the continuously variable transmission, which made this luxury car sound like one of the harpies from Ray Harryhausen's classic "Jason and the Argonauts." This isn't necessarily just a Lincoln thing, however; it's common with CVT's. Anyway, once the Lincoln was in a more "enthusiast wannabe-friendly" mode, I could more fairly sample the car's delights, of which there are many, even though at its heart the MKZ is basically an upgraded Ford Fusion (not that there's anything wrong with that). Sport mode saved this car for me, though I wish it could be activated via an easy-to-access button on the console dash, or wherever - an oversight that could lead to people who prefer their seat cushions bolstered on the sides rather than the bottom to not notice there's a more rewarding driving mode. One thing Lincoln does to differentiate itself from its Ford counterpart is not try to confuse you that it's a pretend Aston Martin. Instead, you get a more upscale, Hercule Poirot-like upturned moustache grille that looks a lot better than the huge, Mr. Sardonicus grin of other recent Lincolns. It's a nice-looking car from the side, too, but its bum is pretty bland, thanks to the ducktail-like spoiler and narrow LED lights that leave lots of room for featureless metal. Beauty is in the eye of the beholder, of course. Motivating the MKZ hybrid is a two litre Atkinson-Cycle inline four cylinder engine with hybrid technology to give it a combination of better gas mileage and better oomph (it feels almost like having a little electric turbocharger). The company rates its oomph output as 188 horses "combined" with 129 lb.-ft. of torque. Those figures look pretty anemic, especially when compared to the more conventional four cylinder EcoBoost engine (240/270) and the three litre V6 (300/277), but I have to admit it was enough to get the MKZ up to traffic speeds with little fuss. I didn't have a chance to take it on any substantial highway trips, but can't imagine it wouldn't be adequate for most excursions. Inside is a classy and modern interior, with Lincoln's push button transmission controller mounted on the dashboard, where it's easy to get at but out of the way. This leaves lots of room on the centre console for open space, or a place to rest your hand. Beware, however: the Lincoln has touch sensitive controls at the bottom of its centre stack, for the audio system's volume control and the fan settings. The little slide pots (instead of knobs) look and are very cool, but in practice while driving they take too much fiddling to control, taking your attention away from the road ahead. And they're sensitive! Brush your hand against one and you've suddenly changed the setting, whether or not you'd meant to. The rest of the interfaces will be familiar to anyone who knows recent Fords, featuring the MyLincoln Touch system of voice control, LCD screens and cascading menus. It works as well here as in other Ford products, which means it works fine but, like the volume/fan controls, requires some fussing about. One feature I thought I'd love was the big, panoramic sunroof. It opens up a lovely hole in the ceiling when you retract it - you could just about parachute through it if you're into such things - but as it opens it slides over the outside of the rear window, and that affects the view behind. Porsche did this with its last generation of 911 Targa, though I don't think it was as obtrusive in that much smaller vehicle. Perhaps Ford/Lincoln could design a feature so that when the big roof is open, one of the LCD screens could show a clear view of what's behind. The THX Audio system is fine. The nannies - such as the blind spot detection, lane departure warning and the like, aren't as obtrusive as in some cars, which is a good thing because I couldn't figure out how to shut them off completely. Oh, sure, I could open the manual but, to me, being forced to the book means the design is fuzzy. As a luxury version of the Fusion, the MKZ succeeds quite nicely. It's equipped well, especially if you option it up, and it looks and feels more upscale than the Fusion despite being the same basic car. And it's also a lot more exclusive than the Fusion, which you see everywhere these days. That may not be what Lincoln wants (I'm sure they'd be pleased as punch if there were as many MKZ's as Fusions), but it's a fact of life right now. The MKZ hybrid starts at $38,460 Canadian. Lincoln's sample came with oodles of extras, including $700 worth of attractive, Bronze Fire paint, the $5640 Equipment Group 203A (navigation system, blind spot detection, THX audio, 19 inch wheels, heated steering wheel, power trunk, rear heated seats), as well as an aluminum trim package, technology package, block heater, the panoramic sunroof and multi contour seats. Total tab for the sample was $52,125, sans other charges and taxes.